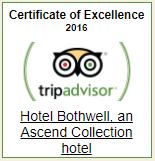 Something “new” is at the Hotel Bothwell! A vintage 1930 Chrysler Limousine! Climate controlled, driver/passenger security window, sun roof, seats up to 4 people. View more information here.